Storm changes it up a little on the SP2 603 with more of an athletic shoe style. With these, they are also introducing the interchangeable soles and heels technology on both shoes. The sporty style and creative colors bring a new look to the lanes that people are enjoying! I bowl in these 3-4 days a week. Very comfortable. The shoes don't hold up. Velcro quit gripping toe area. League play, tournaments. Velcro quit working on toe area on slide foot in less than a year. I bowl 3 nights a week plus several tournaments a months and these shoes are very comfortable. I've had them over a year now and they are holding up great! Hi, we have not received any negative feedback on the shoes not holding up well to toe drag. Storm has implemented reinforcement in the toe area, as you can see with the stitching of the rubber at the toe. Hello! From the feedback we have received, this shoe seems to run true to size. It says RH or LH, but when ordering shoes there was no option to select. How does that work? This shoe has interchangeable soles on both shoes. To make this shoe a RH shoe you would put the traction sole on the right foot and slide sole on the left foot. To make this shoe a LH shoe, you would switch the pads and put the traction pad on the left foot and slide pad on the right. The soles can go to either foot so it is RH or LH. What is the true fit guarantee? Hey Tina! The True Fit Guarantee is that we promise that our products will fit you perfectly, or we'll exchange them at no additional cost to you! We'll pay all the shipping costs! Just try them on, and if they don't fit, exchange them for the right size. We'll ship the replacement immediately. Do these come with some kind of warrenty? ie...the velcro not sticking? Hi Tina! These will have a one year manufacturer's warranty. Do this sjor come in wide width? One of the reviews refers to the velcro not holding up. Where is the velcro on this shoe? The Velcro is on the bottom of the shoe holding the slide soles and heels into place. 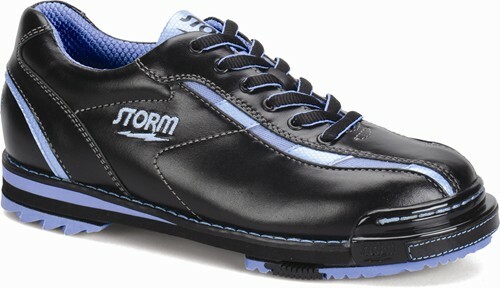 Due to the time it takes to produce the Storm Womens SP2 603 Black/Blue RH or LH ball it will ship in 2 bus. days. We cannot ship this ball outside the United States.